The Annenberg Public Policy Center’s annual civics knowledge survey is cited in a bill introduced in Congress this week called the Civics Learning Act of 2019, which aims to increase K-12 civics education programming. The proposed legislation, to amend the Elementary and Secondary Education Act of 1965, is sponsored by Rep. Rob Woodall (R., Ga.) and Rep. Alcee Hastings (D., Fla). 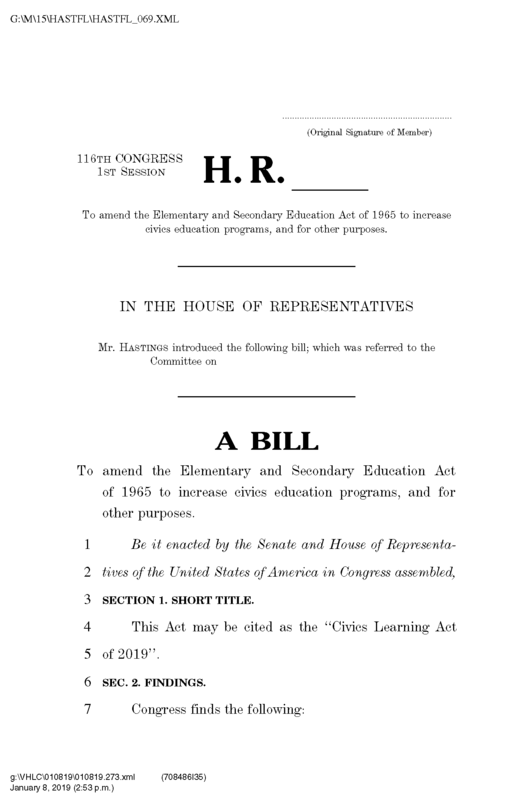 According to a press release from Hastings’ office, the Civics Learning Act “authorizes $30,000,000 for innovative and evidence-based civics learning and teaching programs, including but not limited to hands-on civic engagement activities, online and video game-based learning, service learning, and activities that include participation in student governance and learning about the Constitution.” Attention is also given to ensuring funding for low-access, underserved, and high-needs schools and areas. and in 2017, 37 percent of those surveyed couldn’t name any of the rights guaranteed under the First Amendment. The Annenberg Constitution Day Civics Survey is directed by APPC director Kathleen Hall Jamieson and Ken Winneg, APPC’s managing director of survey research, and released each year for Constitution Day (September 17th). Click here for the full text of the proposed legislation.